I’m fairly new to embroidery and spinning fine yarns has never been high on my list of fun until I found my reason - to embroider with it. The combination of embroidery and silk is really incredible. I do a loose, casual kind of surface embroidery, a few flowers here, a lovely edging there. It’s relaxing and so wonderful to be learning something new. For me silk is so much more alive than cotton when stitching. 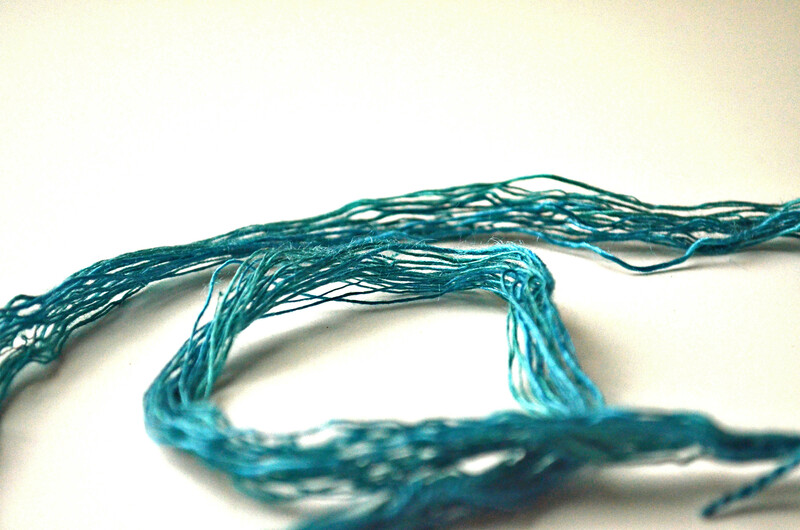 Add the handspun element to that with it’s organic feeling and it’s pretty irresistible. 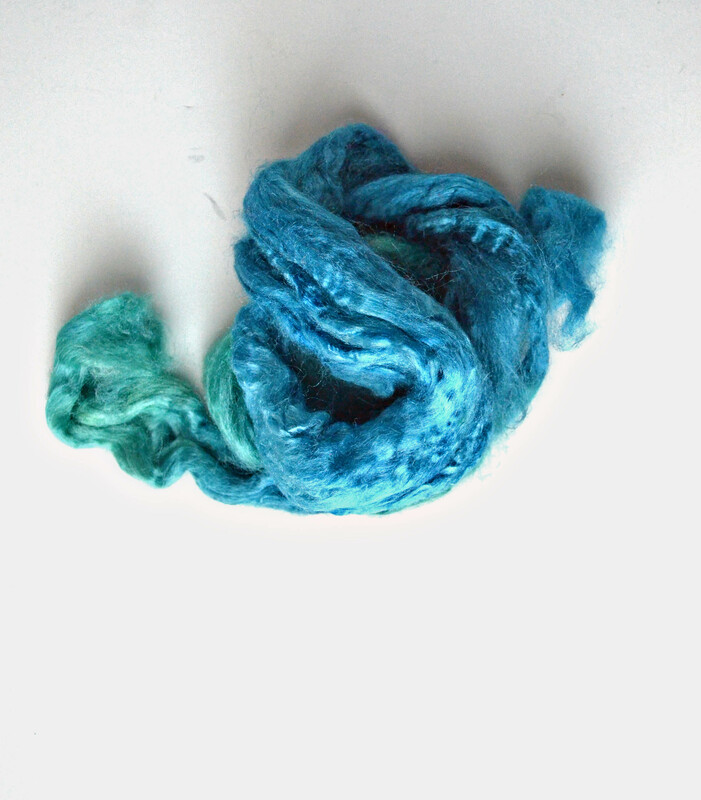 I experimented with a bit of tussah silk top from Treenway Silk. I was curious to see how some basic embroidery stitches would look when I changed the ply twist in my yarn. I spun my singles at about 40 WPI with a worsted draft, it’s as fine as I want to go right now, while I work on getting more consistent with my fine yarn. There are slubs in the tussah silk and unevenness in my spinning and I left them all in the yarn. I like the look; I’m not trying to replicate machine spun threads. 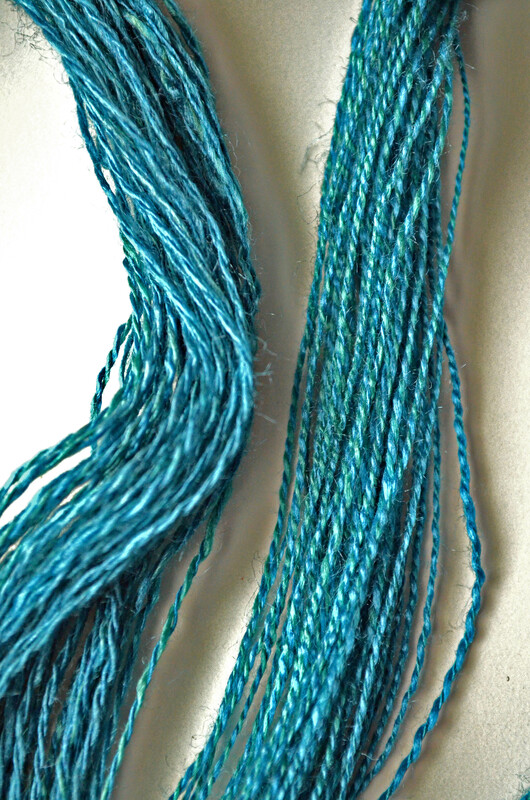 I plied the singles with two different twists. One is plied just or a little under balanced. The second is plied with double the twist. Once I figured out the treadle count for a close to balanced ply, I used twice the number of treadles for the second batch of yarn. Then I stitched. 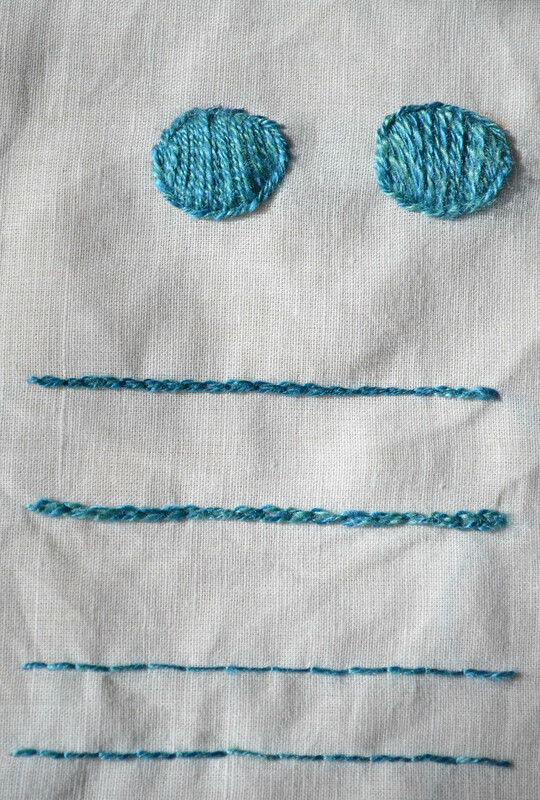 I just did four of the most basic stitches to get a feeling for the difference. I did (bottom to top) back stitch, chain stitch and satin stitch outlined with stem stitch on linen. I used a needle with a bigger eye than I would for cotton, or even machine spun silk. I wanted to make a bigger hole to pull the thread through so it would abrade less when stitching. Back stitch shows the basic difference in thickness. The bottom line of stitches is the less plied yarn and the top is more plied yarn. The less plied yarn looks like a softer line. That visual softness will show more in other stitches. 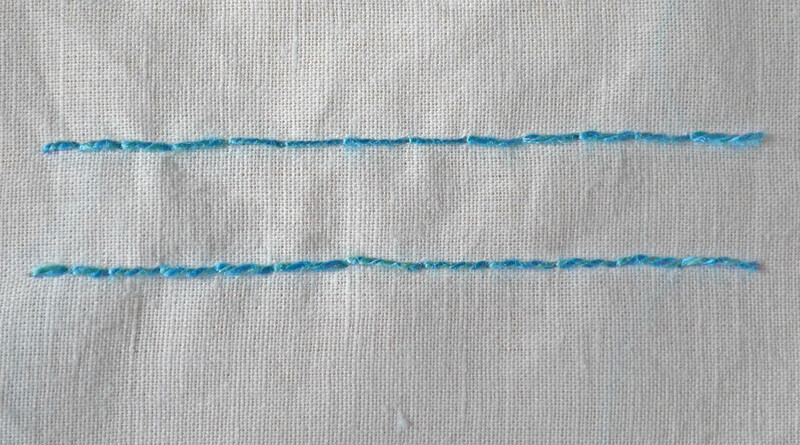 Chain stitch shows even more how the looser plied thread, bottom stitches, is softer and spreads out. The line looks almost fluffy. The top line with the tighter plied yarn looks crisper. I definitely use the different plies for different effects in stitching. Look at the satin stitch circles. 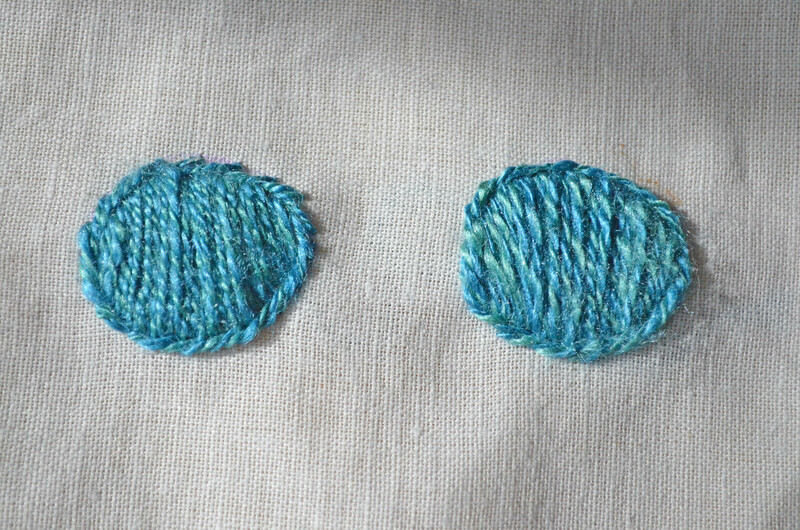 The left circle is the more tightly plied yarn and the right is the looser plied. The looser plied yarn spreads out and fluffs up. I used less yarn to fill the circle. The tighter yarn has more definition and more shine. 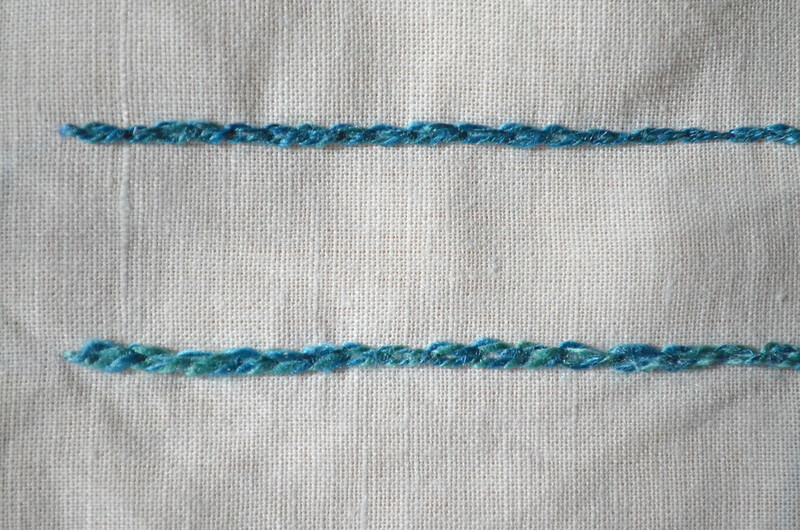 The stem stitch around the outside of the circle is much more defined with the tighter twist. I loved experimenting with tussah ply twist and stitching. I will use the tighter plied yarn for outlines and when I want a crisper line – stems, lettering, edges to divide or contrast. The looser plied yarn I will use for filling and edges that I want to be soft and for areas and lines of transition. I wonder if bombyx silk would behave the same way? Now I’m off to experiment more! 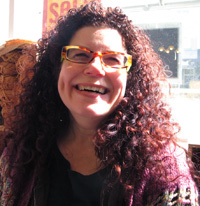 Jillian Moreno is passionate about handspun yarn. She is perpetually curious and always is experimenting with spinning and using fiber. She loves to inspire other spinners to try new things. She is the Editor of Knittyspin, the spinning little sister of Knitty.com. She is a regular contributor to Ply Magazine and sits on the editorial board. She is currently working on a spinning book to be published by Storey Publishing. Keep track of all of her crafty and other pursuits starting April at www.jillianmoreno.com She lives buried in a monumental stash of fiber and books in Ann Arbor, Michigan.